I started writing some weekly thoughts on football last year, so IÃ¢â‚¬â„¢m going to give that a shot again, probably sometime on Monday or Tuesday whenever I get up, which is usually around 1 p.m. The Jay-Z/Eminem concert at Yankee Stadium on Monday pushed this back a bit. IÃ¢â‚¬â„¢ll also preface this, as usual, by saying I donÃ¢â‚¬â„¢t really know an enormous amount about football relative to other sports, but I enjoy looking at it from a social and cultural standpoint. IÃ¢â‚¬â„¢m sure everyoneÃ¢â‚¬â„¢s sick of this situation with TV Azteca reporter Ines Sainz getting heckled by the Jets Ã¢â‚¬â€œ thatÃ¢â‚¬â„¢s the nature of things now, Twitter makes you sick of things the moment you hear about them. And this sort of thing comes up every couple years and eventually just goes away without any real change affected, so IÃ¢â‚¬â„¢d imagine this will probably be about the same, though maybe Roger Goodell does something here. I canÃ¢â‚¬â„¢t think of what it would be. But to those saying Sainz Ã¢â‚¬Å“brought it on herselfÃ¢â‚¬Â by wearing revealing outfits, that reeks of jealousy and latent sexism. Whatever the Jets said to her, IÃ¢â‚¬â„¢ve much likely heard far worse spewing from people who blame her for being harassed. WeÃ¢â‚¬â„¢ve all seen the pictures of what she was wearing that day. Would I consider that traditional attire for a sports reporter? No, probably not. But considering the amount of reporters IÃ¢â‚¬â„¢ve seen at games wearing wrinkled, stained shirts Ã¢â‚¬â€œ even t-shirts on occasion Ã¢â‚¬â€œ looking like they came to the game in what they slept in, thereÃ¢â‚¬â„¢s a fair amount of pot/kettle stuff going on here. IÃ¢â‚¬â„¢m not going to pass judgment on SainzÃ¢â‚¬â„¢s legitimacy as a sports reporter Ã¢â‚¬â€œ IÃ¢â‚¬â„¢d never heard of her or TV Azteca before this. I do think it sounds a bit off-kilter that sheÃ¢â‚¬â„¢s apparently spent time measuring quarterbacksÃ¢â‚¬â„¢ biceps on camera for whatever reason, but IÃ¢â‚¬â„¢d suggest ESPN has had its male journalists do their fair share of comparable nonsense. Honestly, it probably wouldnÃ¢â‚¬â„¢t have mattered what she wore. SheÃ¢â‚¬â„¢s a former Miss Universe contestant; IÃ¢â‚¬â„¢d imagine things would have gone the same if she wore a burlap sack. She wasnÃ¢â‚¬â„¢t there to pick up athletes or whatever; sheÃ¢â‚¬â„¢s married. I think she feels good about how she looks and dresses accordingly. And the fact is, it really doesnÃ¢â‚¬â„¢t actually matter how she looks. Athletes have a long history of treating female reporters with a blanket utter lack of respect. I remember my first time in a college basketball locker room following a game as a credentialed member of the media, with a female reporter from the school newspaper also present. She wasnÃ¢â‚¬â„¢t a beauty contestant type, just a regular young woman, dressed quite modestly. A fairly prominent player walked in from the shower wearing a towel, saw her and deadpanned, Ã¢â‚¬Å“Oh wow, female reporter.Ã¢â‚¬Â He promptly dropped his towel in the middle of the room and proceeded to strut past her naked. It was obvious to me she was uncomfortable, but she averted her eyes and continued with the interview she was conducting. The player in question is actually a genuinely good person, but he was a freshman at the time and was clearly carried away by the frat-house vibe of the locker room setting, which is sort of the accepted way for things to be. I wouldnÃ¢â‚¬â„¢t have expected the school or the athletic department to say anything, and I would think the reporter I knew chalked it up to something that simply goes with the territory. If this situation with Sainz does anything, maybe it makes the next group of idiots think twice before heckling a woman reporter, seeing how lousy the Jets came off here. I wouldnÃ¢â‚¬â„¢t expect things to change too much Ã¢â‚¬â€œ they didnÃ¢â‚¬â„¢t with Lisa Olson, Suzi Kolber or the Erin Andrews video pervert, why would they here? But Sainz aside, what it definitely wonÃ¢â‚¬â„¢t alter is the lack of respect from the general public given to most women attempting to carve out a career in the world of sports, where being attractive can often be more a curse than a gift in terms of perception, and where itÃ¢â‚¬â„¢s not conceivable that someone simply has worked hard to get to where she is. The usual spate of first-week injuries Ã¢â‚¬â€œ Ryan Grant, Kris Jenkins, Kevin Kolb Ã¢â‚¬â€œ is yet another sign of how preposterous it would be to extend the NFL season to 18 games, which the league and owners have pushed for. With more and more coverage of how playersÃ¢â‚¬â„¢ quality of life, and life span itself, are severely affected after their career ends, itÃ¢â‚¬â„¢d be ridiculous to tack more games on. I understand this is a business and thereÃ¢â‚¬â„¢s a bottom line at play here, but every single injury would be scrutinized and overanalyzed if there were more games in the offing, and itÃ¢â‚¬â„¢s negative publicity that the NFL doesnÃ¢â‚¬â„¢t want. TheyÃ¢â‚¬â„¢d prefer you not to know what happens to their players after they leave the sport, thinking of them only as invincible comic-book characters in Chunky Soup ads. Making the sport even more of a war of attrition is not the way to go. The JetsÃ¢â‚¬â„¢ failure in Week 1 wasnÃ¢â‚¬â„¢t hard to see coming Ã¢â‚¬â€œ in fact, I did, in a weekly pick pool IÃ¢â‚¬â„¢m doing this year. I didnÃ¢â‚¬â„¢t anticipate their offense would be quite as lousy as it looked, but the Jets have a long history of wilting under vast expectations. The year after they nearly knocked off the Broncos to go to the Super Bowl, they came into Bill ParcellsÃ¢â‚¬â„¢ final year with the highest of aspirations, only to lose Vinny Testaverde in the first game and finish 8-8. Two years ago, when they signed Brett Favre Ã¢â‚¬â€œ which seems like ten years ago Ã¢â‚¬â€œ they started off 8-3, only to collapse when Favre injured his shoulder. Though thereÃ¢â‚¬â„¢s a lot of time left and their defense is very good, even without Jenkins, they certainly donÃ¢â‚¬â„¢t look like they have the offense required to go anywhere near a Super Bowl title. WouldnÃ¢â‚¬â„¢t it have been better not to put an enormous bulls-eye on their chests with Hard Knocks and all of Rex RyanÃ¢â‚¬â„¢s talk? I generally think itÃ¢â‚¬â„¢s a better idea not to talk as much as he has unless itÃ¢â‚¬â„¢s a psychological weapon that youÃ¢â‚¬â„¢re pretty sure you can back up. With Mark Sanchez at quarterback, he couldnÃ¢â‚¬â„¢t possibly have been that sure, and bluster fails to be as effective when people realize you canÃ¢â‚¬â„¢t score any points. IÃ¢â‚¬â„¢ve never valued character very much with fantasy sports. In fact, when drafting fantasy baseball teams, IÃ¢â‚¬â„¢ve always done my best to pick as many guys who were obviously on steroids as I could. You donÃ¢â‚¬â„¢t get any bonus points for having a team full of upstanding citizens. This started way back in 2000, when my first fantasy team was chock full of obvious juicers such as McGwire (32 homers in 89 games), Tony Batista (41 homers), Richard Hidalgo (44 homers) and Manny Ramirez (.351/.457/.697). Even Jason Kendall had an .882 OPS that year. Not surprisingly, I ran away with the title. I might have outdone myself this year, though. I drafted Kevin Kolb in both my football leagues, and out of desperation, IÃ¢â‚¬â„¢m starting Vick against the Lions on two teams this week, forced to root for someone I like about as much as a sore throat. 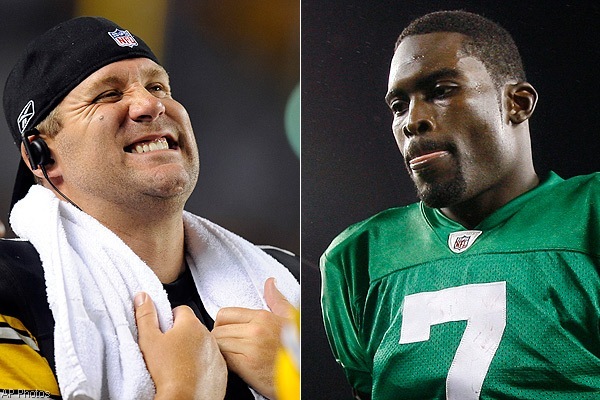 In fact, on one team, my two quarterbacks are Vick and Ben Roethlisberger, the most despicable tandem in the history of fantasy football. I can only hope for the same sort of success as my roided-up baseball teams usually have, as they seem immune to karmic penalties. 1. Saints (1-0) Ã¢â‚¬â€œ Almost better to see them win with toughness vs. Vikes than airing it out. 2. Packers (1-0) Ã¢â‚¬â€œ Knocked out Kolb early, withstood Vick, should destroy Bills at home. 3. Vikings (0-1) Ã¢â‚¬â€œ No shame in losing to the Saints, and Vincent Jackson rumors are emerging. 4. Texans (1-0) Ã¢â‚¬â€œ Arian Foster gives them a new dimension, as shown by destruction of Colts. 5. Ravens (1-0) Ã¢â‚¬â€œ DidnÃ¢â‚¬â„¢t look amazing, but beat Jets on the road. Boldin a key acquisition. 6. Colts (0-1) Ã¢â‚¬â€œ TheyÃ¢â‚¬â„¢re still good, still have Manning, but Sanders injury Ã¢â‚¬â€œ as usual Ã¢â‚¬â€œ hurts. 7. Patriots (1-0) Ã¢â‚¬â€œ WelkerÃ¢â‚¬â„¢s return a great sign. I still wonder about their defense. 8. 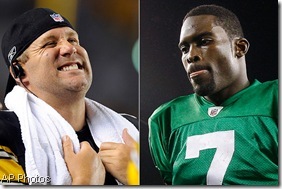 Steelers (1-0) Ã¢â‚¬â€œ All they really have to do is go 2-2 until Big Ben gets back. Now 1-2. 9. Jets (0-1) Ã¢â‚¬â€œ TheyÃ¢â‚¬â„¢re not as bad as they looked, but they need to find offensive identity. 10. Cowboys (0-1) Ã¢â‚¬â€œ I generally buy into their hype, and I think that offense is going to click. Here are 3 picks for Week 2 Ã¢â‚¬â€œ something new IÃ¢â‚¬â„¢m trying this year. 1. Packers (Ã¢â‚¬â€œ13) vs Bills Ã¢â‚¬â€œ Enormous spread, but good Bills pass D not a deterrent in GB. 2. Chiefs (+1.5) at Browns Ã¢â‚¬â€œ Stunned the Chargers, this would be far less of a shock. 3. Patriots (-2.5) at Jets Ã¢â‚¬â€œ Even if this is a field goal battle, Pats can cover.